You are currently browsing articles tagged science center. I would say this this past week was our first (much needed) dose of spring. The sun has been shining all week and it has done so much to lift the spirits of everyone on campus as we deal with the difficult events of the other week and prepare for the onslaught of final assignments. I had a difficult time figuring out how to share my perspective on the tragedy at the time, but I could write a novel about the outpouring of love and support in the Harvard community since. For example, I found the most inspiring email in my inbox earlier today. One of my blockmates forwarded me the link to a page for a Recovery Fund for a man named Jimmy who had been injured in the bombing at the Boston Marathon. At first, the name didn’t register with me. I did, however, notice that the message had been forwarded from email list to email list, so I clicked on the link to the page out of curiosity. When the page loaded, I instantly recognized Jimmy from our countless exchanges my freshman year. As it turns out, Jimmy worked in the Freshman Mailroom (in the basement of the Science Center), so he interacted with many Harvard students interacted with him on a regular basis. Checking your regular mail is a relatively impersonal experience (since each student has a personal mailbox), but in order to collect a package you check in with someone at the Mailroom Window. Jimmy was often the person greeting students at the window, and in his position he has shared countless conversations with countless Harvard freshmen over the years, myself included. I am not a particularly sentimental person, but I was touched to see how many of my classmates recognized the important role that Jimmy and the Mailroom staff serve on campus, and were willing and eager to share the link with their peers. I wanted to take a moment and share it with all of you as well. As I mentioned in my post the other week, I am working at the Harvard Legal Aid Bureau, which is a part of the Harvard Law School. I am incredibly lucky because my morning commute is just a casual stroll across the campus. It only takes me about 10-15 minutes to get to the office each morning, and to return home in the evening. No train, bus, or cab necessary. I especially enjoy my walks to the Bureau because there is a lot of construction on campus at the moment, and gauging the progress keeps me entertained as I walk from place to place. 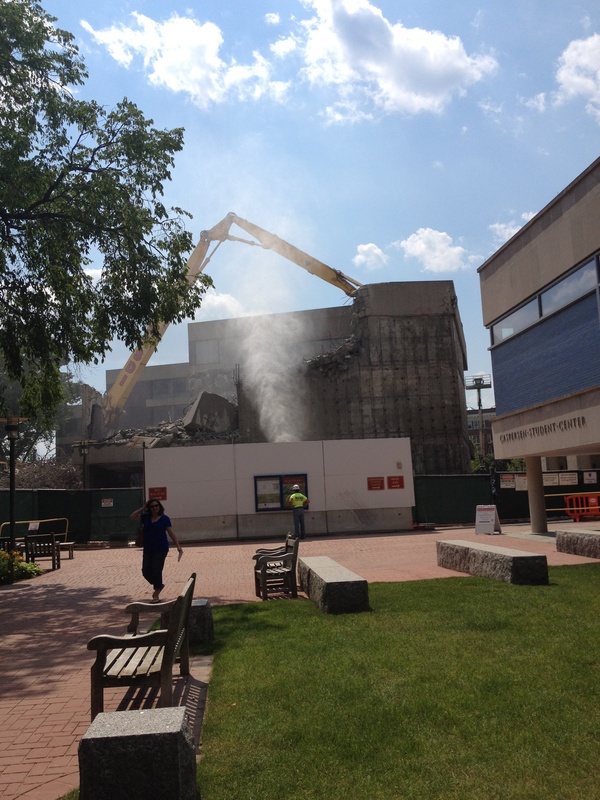 For example, at the law school they are working on tearing down a building called Pound Hall so that they can build a better version. The Pound Hall Project is just one aspect of the law school’s makeover. The University recently completed the Wasserstein Hall, Caspersen Student Center and Clinical Wing Project, and the building is amazing. Even though I am an underclassman at the College, I plan on hanging out in Wasserstein during the school year. It has a lot of study space and social space and it’s refreshing to try out new, “exotic” spaces when I am reading or writing. Generally speaking, Wasserstein has garnered a lot of positive feedback so I am looking forward to seeing how Pound Hall turns out. The construction at the law school is obvious. The buildings are enormous, so you can’t help but notice noise created by the large machinery, the rumble of demolition, and the piles of debris left behind. That being said, I have also noticed some smaller-scale changes being made to the campus. I pass the Science Center on my way from Adams House to the Bureau, and near the side entrance of the building is an example of a more subtle construction project. 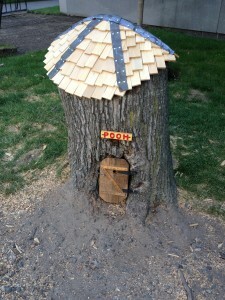 Even though as children we were taught that Winnie the Pooh lives in the fictional Hundred Acre Wood, for many Harvard students, Pooh’s home is located just outside the Science Center. I first noticed Winnie the Pooh’s house during my freshman year, on my way to pick up a book from the law school library. I instantly fell in love with it. It’s an unexpected, and adorable, addition to the campus. 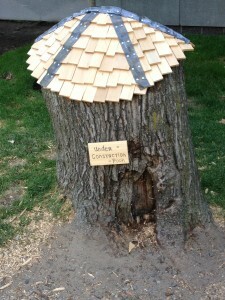 It is also cool to think that some individual or group were creative enough to come up with this beloved campus quirk. Unfortunately, when the spring semester came to a close I was bummed to discover that Pooh had lost his home to building maintenance! 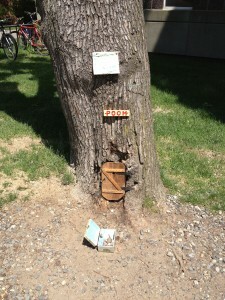 The University cut down a small group of trees, which were too close to the Science Center, including the tree that served as Pooh’s residence. I thought it was the end of Pooh’s tenure at Harvard, but luckily, the University had the foresight to leave the tree stump behind and within a couple of weeks Pooh’s house was renovated to include a roof, as well as a brand new door and sign. Under Construction, but check out the roof! Pooh’s house as it stands today! Note the new sign and door. It’s easy to be annoyed or frustrated when there is construction on campus, but I can’t think of a time when the end product was not worth the wait! This past week has been very interesting and exciting. At the beginning of the week, I attended the STAHR Telescope Training Class. 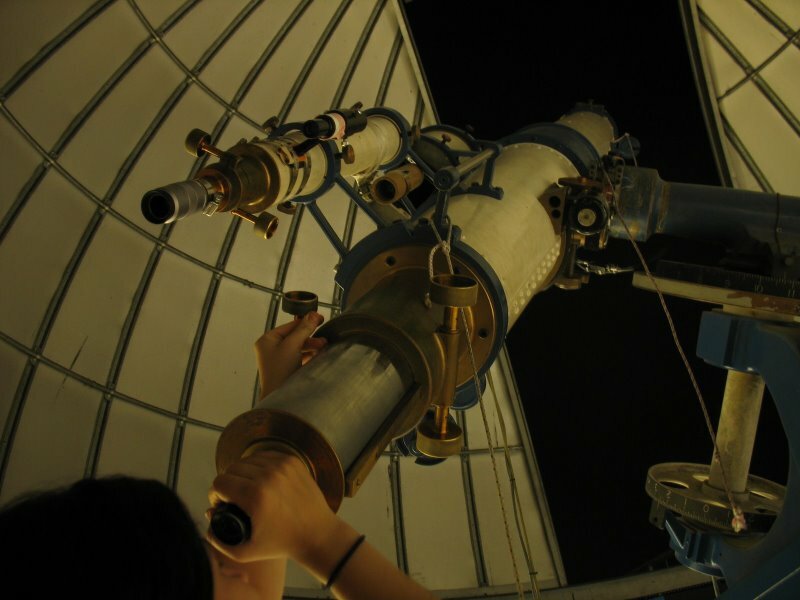 STAHR is an undergraduate organization, which stands for Student Astronomers at Harvard-Radcliffe. The STAHR club meets in an observatory located at the top of the Science Center, one of Harvard’s main buildings for science classes and labs for undergraduates. During the class, we received hands-on practice using a telescope and were taught how to use star maps to locate constellations in the night sky. The telescope we used is called the Loomis-Michael Telescope, and it’s quite large! On this particular night, Jupiter was visible, and we were able to see the color scheme of the planet, as well as four of its moons. An officer handling the Loomis-Michael Telescope in the observatory. 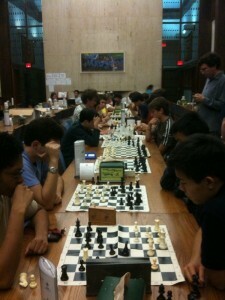 In addition to the STAHR club meeting, I attended the chess club meeting this week. The chess club traveled to Stamford, Connecticut to compete at a regional prize money tournament. This week, they had an informational meeting where they went over different strategies. 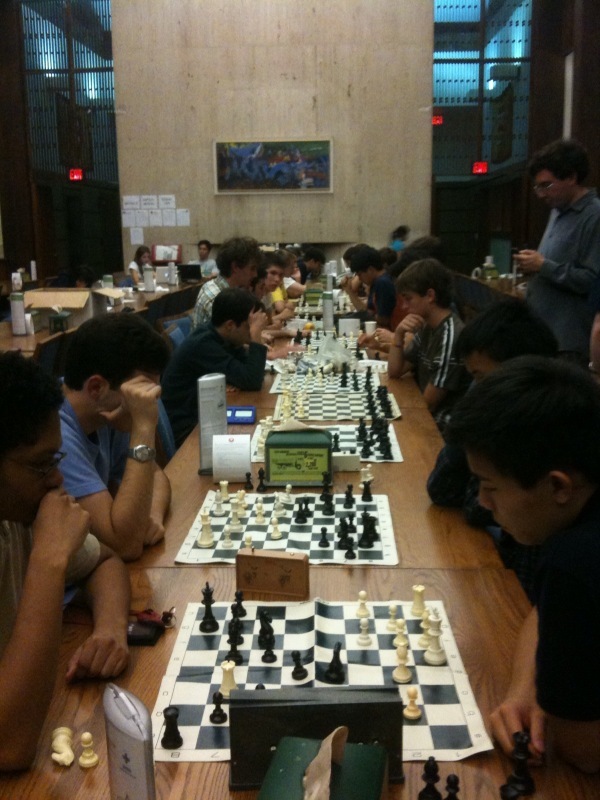 Chess club meetings are a low time commitment, usually lasting only an hour or two. After the formal training part of the meeting, we paired up and played several games of chess. 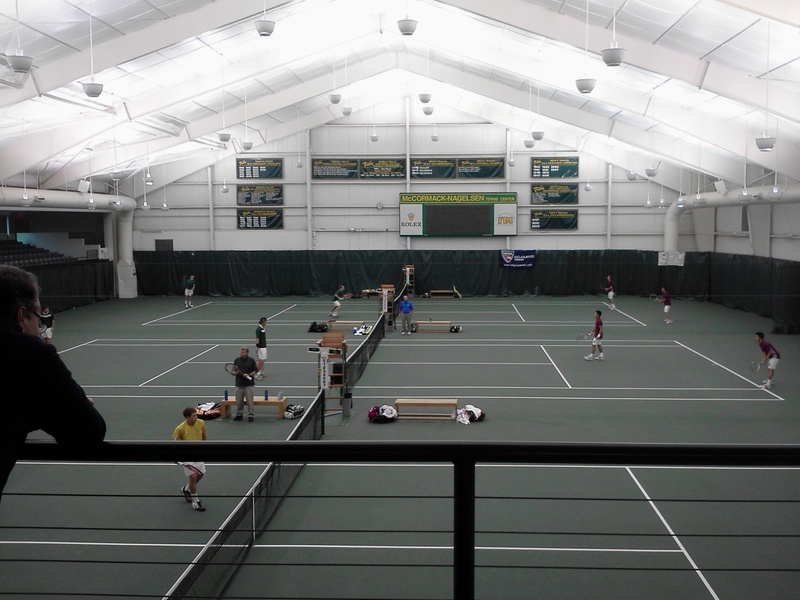 This past weekend, the Harvard Tennis Team competed at an invitational event at William and Mary. At the invitational event, four teams competed- William and Mary, University of Maryland BC, George Washington University, and Harvard. Each day, our team played another team in the “college format,” which includes 6 singles matches and 3 doubles matches. 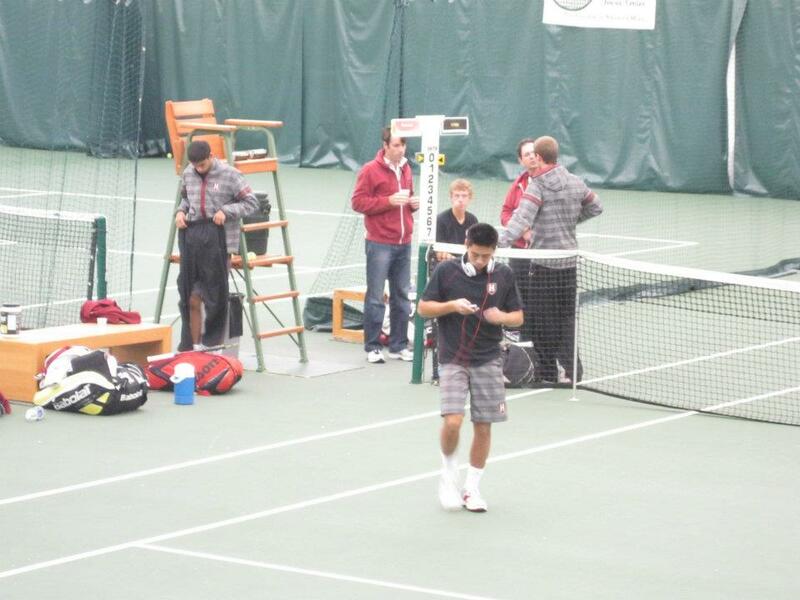 On the first day, we faced University of Maryland BC and swept the singles and doubles matches. 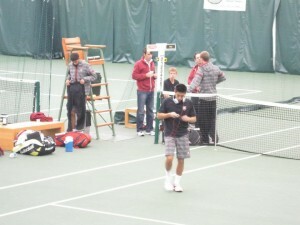 Then, we played George Washington University and won 4 out of the 6 singles matches and 2 out of the 3 doubles matches. 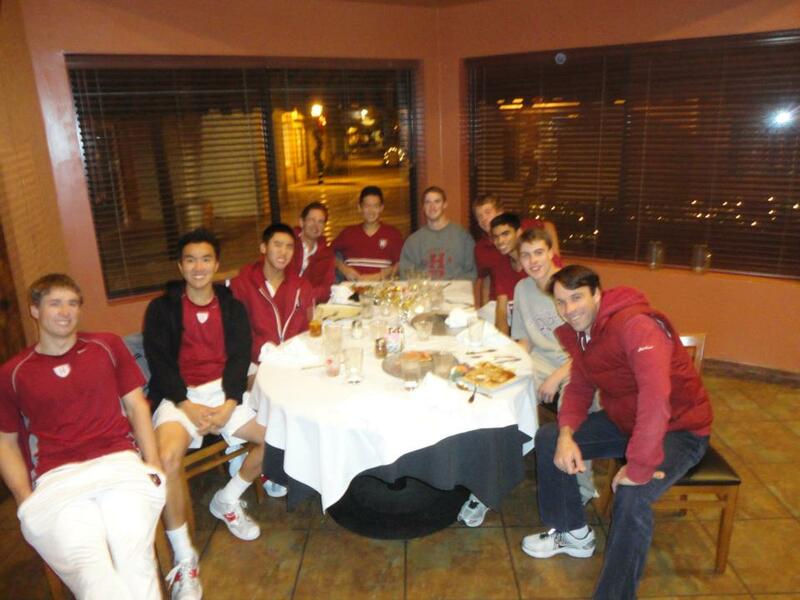 After the matches on the second day, the team had a team dinner in honor of junior Josh Tchan’s birthday. We headed to an Italian restaurant and had a wonderful time. The food was amazing, and it was a great team bonding event. Tennis Team celebrating Josh Tchan's 20th Birthday. On the last day, we played William and Mary and won 5 out of the 6 singles matches and all 3 doubles matches. Overall, it was a great tournament to end our fall season. With the fall season over, the number of workouts have decreased. The team will resume official practices in January, and in the meantime, I’ll enjoy the downtime! After the tournament, the team took a tour of William and Mary’s campus. It was a beautiful day, and the campus was really nice. We took some photos in front of statues (like tourists do on Harvard’s campus!) and visited some of the shops nearby. Tennis Team touring William and Mary's campus. After touring the campus, the team headed to the airport and flew back to Boston. While it was a great trip, I am very happy to back in Boston within the comforts of Harvard’s campus. In response to Stephanie’s comment about her upcoming visit to Harvard, I thought I would post a list of the Top 10 Things To Do When Visiting Harvard. As I began writing, however, my roommate reminded me that admissions letters would be coming out SOON, and that new prospective students would be looking for things to do on their visits (by the way, we’re SOOOOOOOOO excited to meet you guys)!!!! As a result, I took it upon myself to compile TWO lists – one for anyone who just wants to take a look around and one for prospective students! I will include the list of top To Do’s in my next post. 1.) 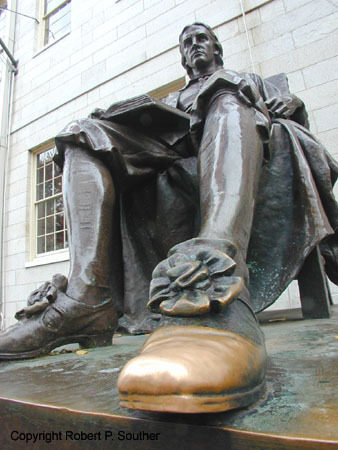 DO NOT under any circumstances touch John Harvard’s foot. As you walk into Harvard Yard, take in its classic beauty, and reflect upon the centuries of history it has witnessed, you may find yourself drawn to a rather iconic statue of John Harvard, also known as the ‘Statue of Three Lies.’ Lest you be unprepared I shall verse you in these lies: 1) John Harvard was NOT the founder of Harvard, he was merely a donor, 2) Harvard was NOT founded in 1638, it was founded in 1636, 3) the man portrayed in the statue is NOT John Harvard… its some rando. All things considered, I personally feel that a fourth lie needs to be added to the list. This lie would be 4) touching John Harvard’s foot is NOT a good idea. I mean, go ahead and rub it for good luck…. Just don’t ask me to shake your hand afterward. It’s easy to say, “Go to Memorial Hall!” or “Go to Widener Library!” but really, the Crimson Key tour covers it all, and they do a GREAT job! Seriously, do yourself a favor and go on their tours. 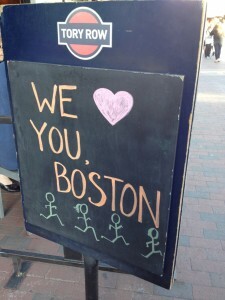 They leave from the Information Center in the Holyoke Center (next to the Au Bon Pan in Harvard Square) at 10:00 am, 12:00 pm, and 2:00 pm Monday- Saturday. It is said that no Harvard student can go all four years without taking at least one class in the Science Center. No, this isn’t because all students are brainiacs – it’s because SO many classes are offered in that huge, ugly building (every college campus has one… even Harvard). As a result, during class transition time – also known as ‘Harvard Time’ – a CRAZY number of students pass through the area right outside (I’ve heard stats saying up to 50% of the undergraduate student body)! If you want a taste of student academic life, go hang out there. Have you seen The Social Network or Good Will Hunting?!?! 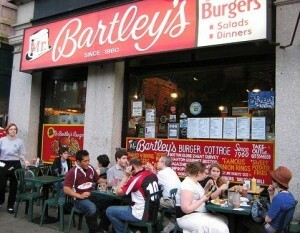 If so, you may have noticed a lovely place featured called Bartley’s. This is because they have THE BEST burgers OF ALL TIME! I’m not joking. This dive has been around for a loooooonnnnggg time, and for good reason. It doesn’t matter if you’re watching your cholesterol, if you’re at risk of terrible food-induced ailments, take the gross caloric hit and GO FOR IT! You won’t regret it. After you get swept away by the wave of students outside of the Science Center, head on inside and grab a snack (or Starbucks) at the Greenhouse Café! This is a major hang out spot for students in between classes, and it’s just a generally cool place to check out. Why visit Harvard if you don’t have something to show for it? The COOP has a plethora of Harvard paraphernalia to offer, PLUS if you’re curious, you can take a trip to the top floor and look at the textbooks students buy for class! 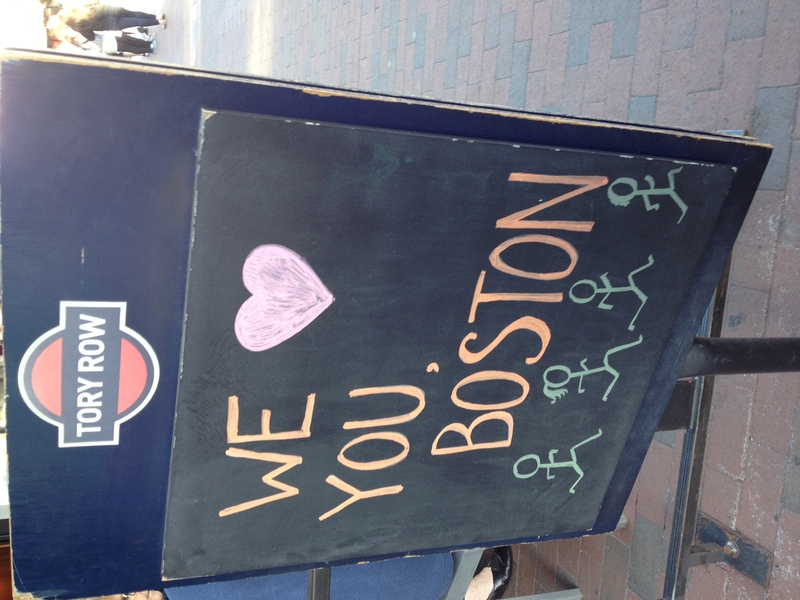 If it’s a nice day, take a walk along the Charles River! It is honestly one of the most beautiful strolls ever, and you can see the River Houses, where sophomores, juniors, and seniors live. While you’re on the river, if it’s Fall or Spring, you might be fortunate enough to witness the Crew team practicing (or racing) on the river! 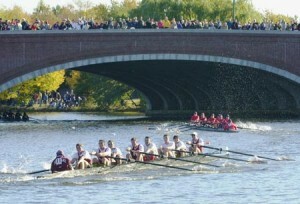 Crew is a BIG DEAL at Harvard, so it’s always a good thing to see. One of the least appreciated spots on campus, Radcliffe Quad is home to three upperclassmen houses (Currier, Cabot, and Pfoho), and is where the women of Radcliffe College used to live! The Quad is less than a mile up Garden Street and has a unique history. If you want a taste for what Harvard nightlife is like, I would suggest walking down Mt. Auburn street between 11:00 pm – 2:00 am on Saturday night and seeing all of the final clubs. I’m not suggesting you try to go in, but you’ll get the sense that Harvard students play just as hard as they work.